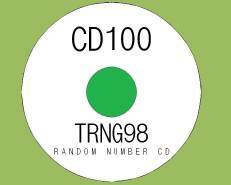 The CD100 contain random numbers taken from our TRNG9803 random number generator. Each CD include 600MBytes of true random numbers intended for research or testing. The CD:s are produced individually. There is, currently, no support application provided with the random number CD:s.